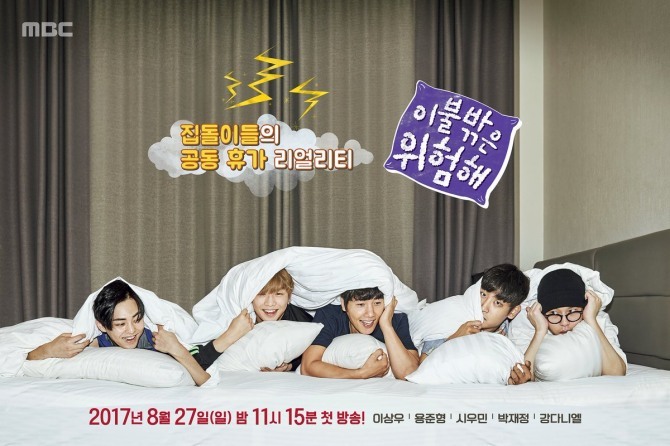 A poster for the upcoming MBC reality show “Dangerous Outside of Bed” (literal translation) was released Tuesday. Featuring a star-studded cast made up of EXO’s Xiumin, Wanna One’s Kang Daniel and Highlight’s Yong Jun-hyung, the show gathers celebrities who enjoy staying at home for a vacation together. Singer Park Jae-jung and actor Lee Sang-woo will also star in the program. In the released poster, the five cast members have a blanket pulled all the way up to their chins. They lie on their stomachs while hugging pillows. “Dangerous Outside of Bed” will premiere on Aug. 27 at 11:15 p.m.